It’s finally here! My 500 blog post giveaway! A little over a month ago I posted my 500th blog on this little nook on the web. At the time of that post I promised that I would have a giveaway contest to honor this amazing fact as without the people reading my daily musings this would be a whole lot less fun. I promised to see what I could bring back from London. I hoped to find some more special items which would make for a more interesting giveaway. And I believe I have found something worth giving away. One person will win this lovely drug store make up set! The colors are very on trend all you’d need is a pop of mascara and you will have a nice looking spring make up. Let’s have a closer look at the products! 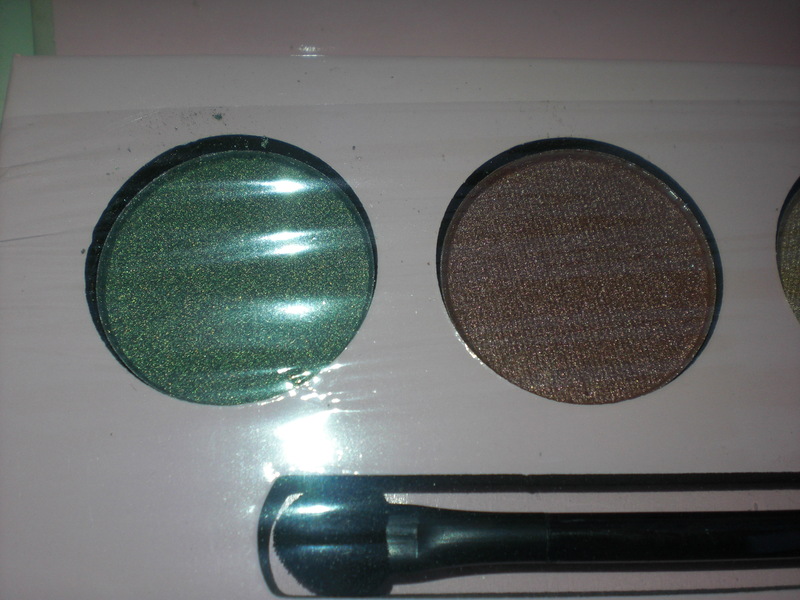 Eyeshadow # 1 is a great shimmery dark green. I think this will be perfect for any time and any person. Greens and purples are my favorite colors to use for a pop of color around the eyes so I’m hoping this will please whoever wins as well. 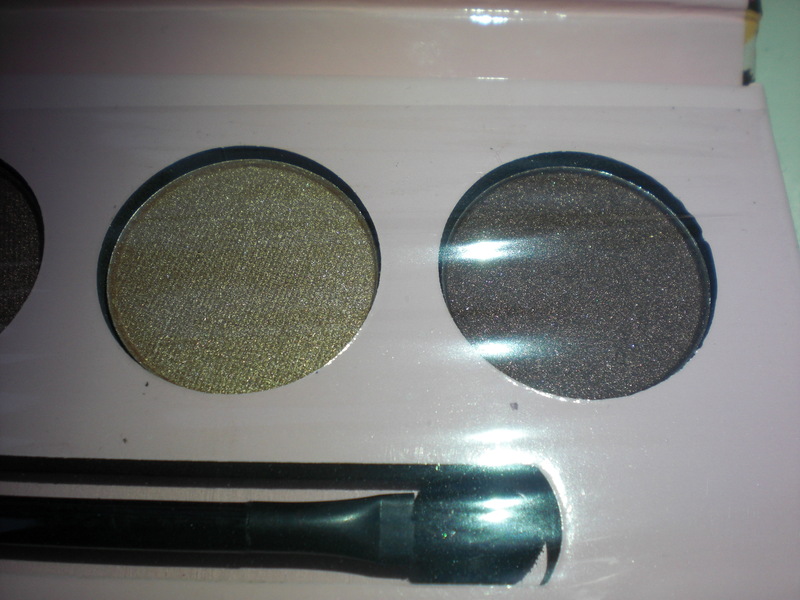 Eyeshadow #2 is a dark brown with some shimmer to it. You can never go wrong with brown eyeshadow. Eyeshadow #3 is a tan/ golden color. Again a color no one could go without. The final eyeshadow, #4, is a gorgeous deep plum color. Can anyone say: crease! I swatched these colors in store and they all seemed soft and well pigmented. I didn’t buy this palette for myself as I already have a bunch of these colors. However, since this palette constitutes the 4 types of colors I love to wear most I thought it would be perfect for a giveaway. 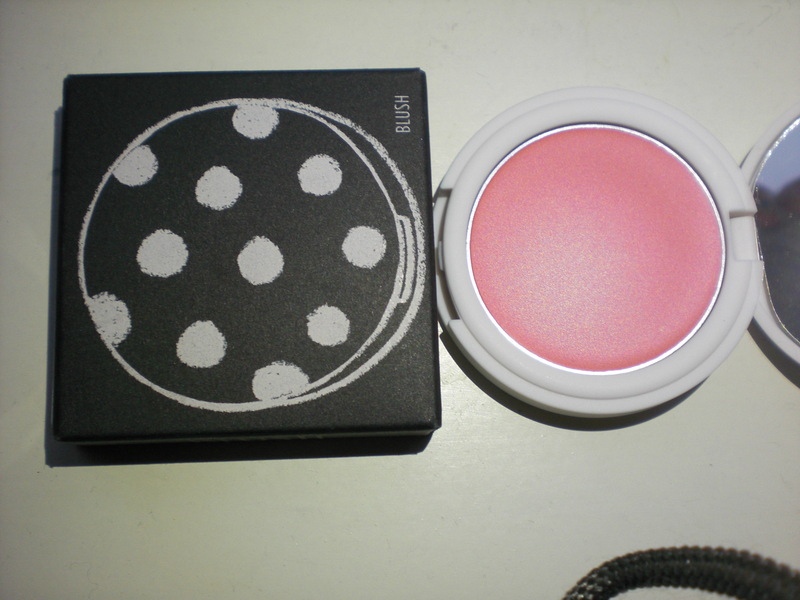 Again, the winner will receive a brand new, untouched blusher which is still sealed. But look at that pigmentation! This is one swipe and the color is just super pretty. Is it pink? Is it orange? No! It’s coral! And since coral is one THE make up colors for spring I decided to also add a coral colored lipstick to the goody bag. 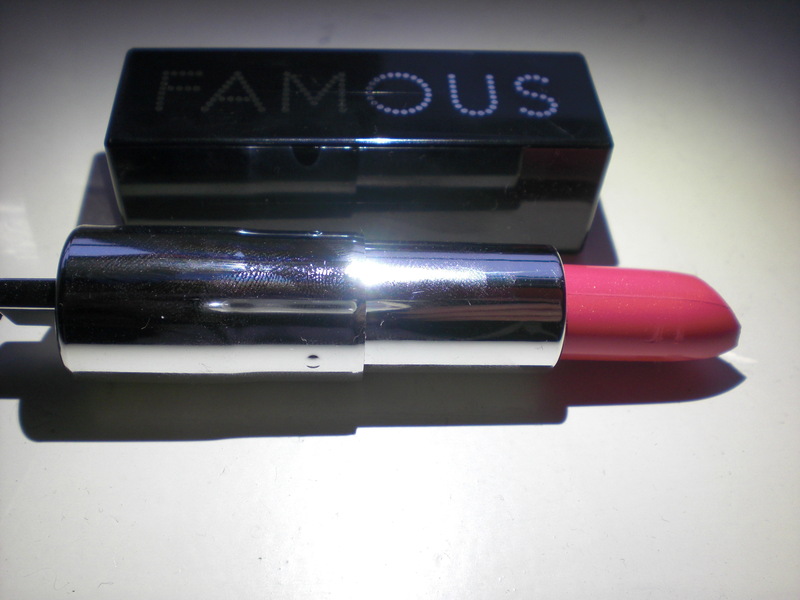 I have no experience with Famous by Sue Moxley lipsticks. 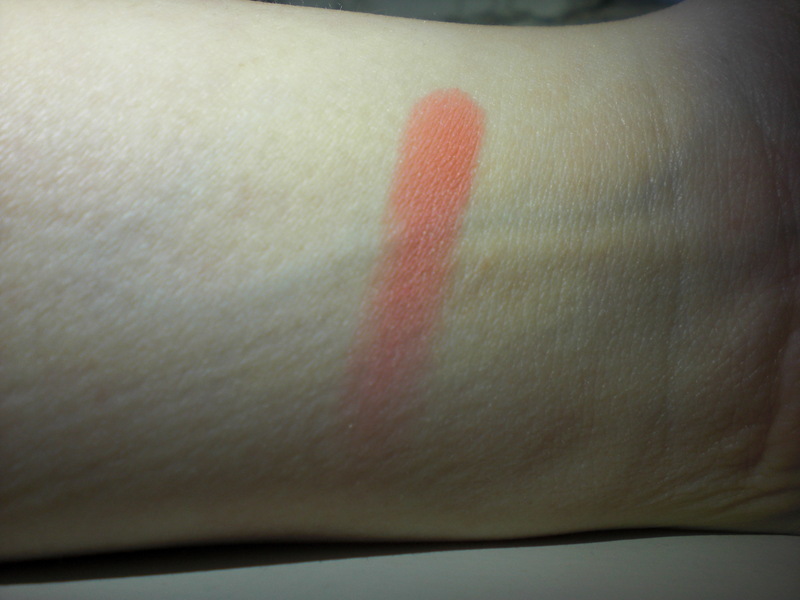 I swatched it in the store (the tester of course) and it went on very creamy and again the pigmentation was great. Unfortunately when I opened the lipstick to take these pictures I noticed that the tip is slightly broken, but that’s due to packaging, because this is how I took it out of the wrapper. I took a close up to show you the color a bit better. This is a more pinky color and it’s super bright, but that’s what so good about it. If you put some on your finger and then dab it on your lips you will get a more subtle, yet fresh color to your lips. Or you could of course go all out and wear it as is. But again, I think this will be suitable for tons of people and I love these bright corals (I bought myself a slightly more orange version from Topshop) so again perfect for the giveaway. Leave a comment saying you would like to enter and tell me what you like reading on my blog. Any feedback really: what would you like to see more of, what do you think I could do without. Just make it constructive so I have something to work with for the next 500 posts . Spread the word by tweeting/ facebooking/ etc. this post and add the link to the comment you’ll be leaving. The deadline for entering has been changed to Sunday March 11th 5 PM CET. The contest is open internationally and anyone can participate. I will pick the winner using random.org and will announce it on Monday the 12th of March. There will be one (1) winner and whoever wins has 24 hours to contact me to claim their prize. If the winner fails to contact me, number 2 on the list will then become the winner and so on and so forth. Happy contesting and good luck! Congratulations! 500 posts! Wow! I only did 55 so far, lol 🙂 Keep up the good work babe! Yay! Good luck everyone with the contest! ———- I love how you do different posts from beauty to thrift/vintage. It’s fun seeing people’s hauls from around the world. Ik moet een wordpress account hebben om te liken he? Oh nou ja, als dat niet gaat hoef je dat niet te doen. Nee dat wist ik niet! Dan zal ik de regels van mn giveaway maar ff aanpassen denk ik. I like the thrift posts.